Whether you are starting to get fall temperatures or not this DIY vest will be perfect for adding an extra layer to adjust to cooling temps. 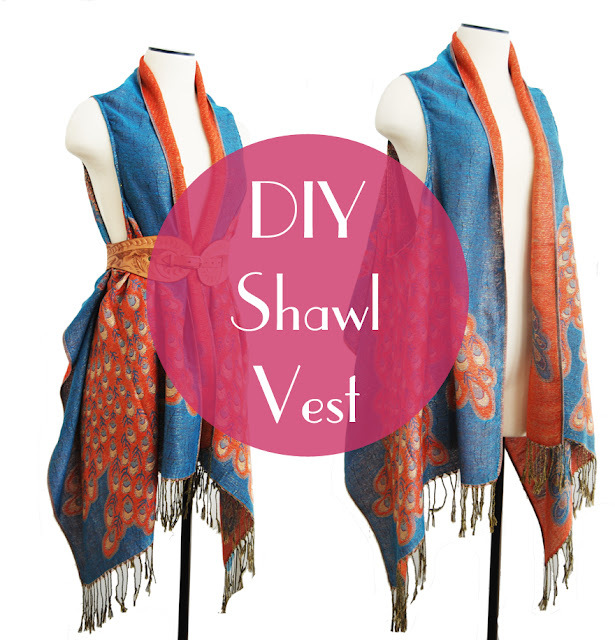 This draped vest is really easy and will layer over anything and stretch your summer wardobe out for longer! First, measure across your shoulders from end to end. Take your shoulder measurement and center it on the halfway mark of the shawl. Each end of the shoulder measurement will be the center point of an arm hole. Next cut arm holes. I used an 8 in diameter circle for the arm holes. Now simply sew any loose seams in. Your vest should be ready to wear! I have some doubts... did you use a 8 cm dimeter circle or a circle with 8 cm of radius? And what's the distance from the border od the shawl to the circle? Thank you. Hello Carol, if you read above under the scarf illustration, it says 8 inch diameter (not cm, not radius) circle. Since I did this project in 2012 and it's been a few years, I no longer have it around for exact measurements. But I do remember placing the holes about 1/3 of the way down the scarf, away from the side that would become the collar. 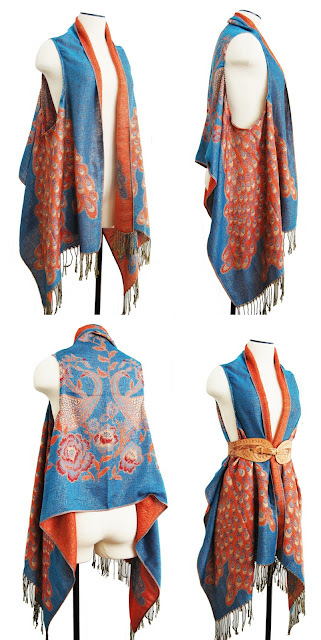 I am thinking of making this with recycled denim and adding pockets along the front or in the corners somehow. Concerned about the draping, using denim, though. I love a challenge... but, don't we all? I'll post pics & diagrams of what I end up with. © Copyright notice: All artwork, designs, and photographs, unless otherwise noted, featured on this blog are the intellectual property of Jess Merritt. All rights reserved. Please don't copy my artwork! The DIY project posts are inspiration for fostering creativity but all other projects are my thoughts and creations, and how I make a living. Also, please link back and accredit accordingly if using or referencing any material on this blog! © All photographs/artwork/designs on this blog are property of Jess Merritt unless otherwise noted. Simple theme. Powered by Blogger.